A sustainable use of resources is really important for us at ARCTIC Thus we updated the packaging of the MX-4 to minimize its CO2 Footprint. The practical, recyclable packaging bag of our thermal compound helps us to reduce the environmental impact of packaging materials by about 40% and thereby save resources. The ARCTIC MX-4 compound is composed of carbon micro-particles which lead to an extremely high thermal conductivity. It guarantees that heat generated from the CPU or GPU is dissipated quickly and efficiently. Superb in performance, MX-4 is the best companion for overclockers and enthusiasts. With an ideal consistency, the MX-4 is very easy to use, even for beginners. 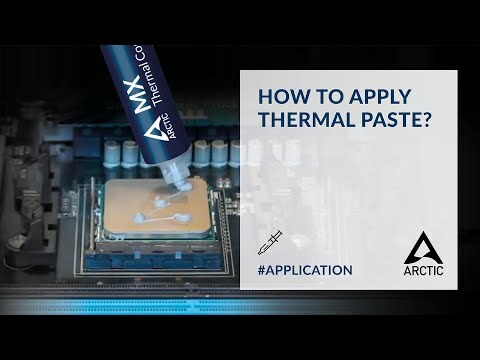 The possibilities for its application and the most effectively way to avoid voids between CPU and cooler we show you in the video. It does not contain any metallic particles so electrical conductivity would not be an issue. Unlike silver and copper compound, it ensures that contact with any electrical pins would not result in damage of any sort. A high performance thermal compound perfect for system builders, there's no surprise that the MX-4 exceeds your expectations for its low price tag. Features • 8.5W/(mK) Thermal Conductivity. • 3.8 x 10¹³ O-cm Volume Resistivity.